I met up with Erin Vincent this Saturday at 99 Gallery. Though I was early, she was there when I arrived. I walked by her to catch a glimpse of the show before we began our talk. I later admitted to her that this was the first time I’ve asked an artist to meet with me before previewing their work. I guess the belaboured pace of my 34th week of pregnancy is causing me to cut a few corners in my normal process. I had been charmed by the photo of Vincent’s work advertising her exhibition on Akimbo, and I was not disappointed by the show. The exhibition is the culmination of 6 months of work, all incited by a traumatic break-up with a photographer/archivist. The resulting concepts orbit around nostalgic depictions of preservation and destruction, which Vincent insists are primarily coincidental collections from her sub-conscious. Indeed, she explains all of the work through wandering autobiographical anecdotes. By the end of our conversation, I was unsure of which I found more intriguing- the work or the artist herself. Entering the gallery, along the right wall is “Bombs,” the first of several wall installations. 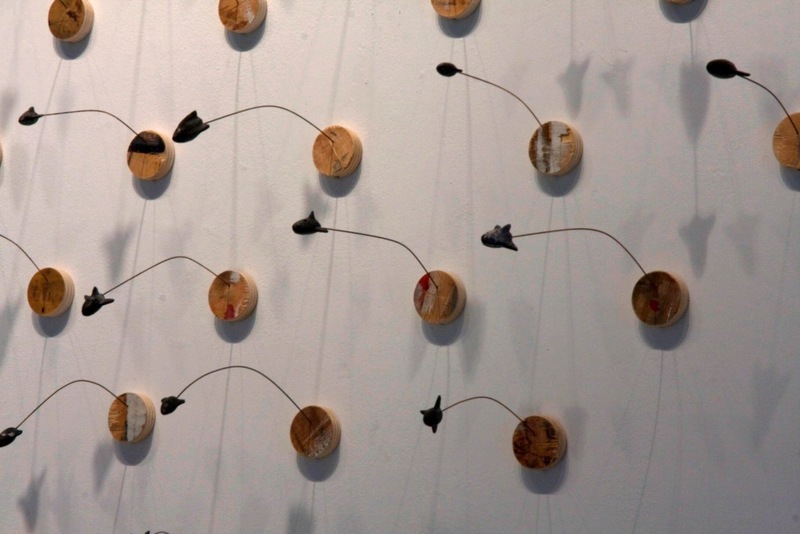 77 tiny missiles, cast in cement from 11 different molds and each hand-finished with a blackened patina, discharge from the wall on pieces of thin wire. At the base of each wire is a perfectly cut circular platform cut from old drawing boards. Each sample shows evidence of childlike innocence- names and doodles carved into the surface. The pairing of the imagery of extreme violence paired with the innocence of childhood is not only an exposure of the multiple layers underneath our superficial perception, but also a consequence of Vincent’s experience as a high-school teacher at Toronto’s notoriously violent Sir Stanford Fleming Academy, where the presence of guns is the norm amidst the student population. At the back of the gallery is an installation of tiny folded paper planes made from maps ofOntarioand nautical charts ofLakeOntariodated from the year of her mother’s birth. The planes, swooping like a vast twisted ribbon across the wall are inspired by the synchronized flights of starlings which Vincent can remember watching as a child. 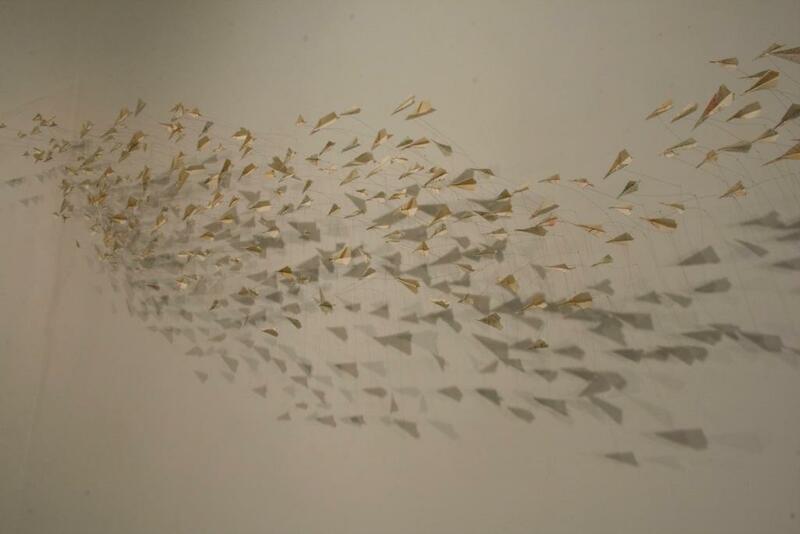 Recalling folding paper airplanes with her grandmother, the piece reflects the frivolity of discard and our lack of heirlooms in contemporary society. While the dates on the maps reflect the year of her mother’s birth, Vincent admits that she would never destroy pieces of her own family history for the sake of her art. She also affirms that the process of dissecting historical documents was somewhat of a release after her separation from the archivist. The airplanes arise again within a series of sculptural memoirs preserved under large turn-of-the-century bell jars. It’s unsurprising that these little crafts are such a recurrent motif once the artist reveals that she has lived not only inCanada, but also inEngland,KoreaandFrance. Within these pieces, Vincent has constructed her wee jets from maps of places she has lived, and combined them with miniature bronze replicas of personal effects- her couch, her kitchen table. Usually preferring to work quickly, taking items from a vast personal collection of flea market finds, the bronze was the element that forced Vincent into the 6 month conceptual commitment that became this show. Ironic considering the catalyst was a break-up. 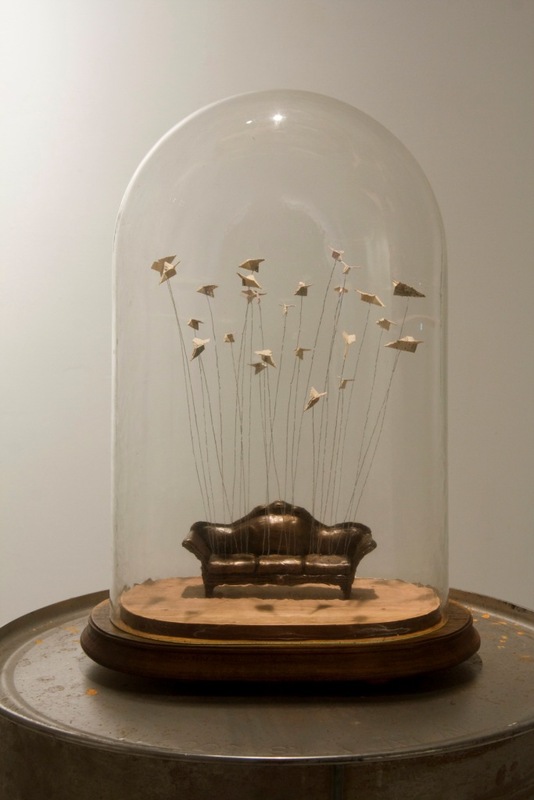 Evidence of this more whimsical style of production is seen in her series of “Smalls,” which feature an array of bizarre little sculptures made from some of her favourite recurring motifs- planes, clouds, bits of ivory (her family is from the Yukon, where apparently there is still an abundant ivory barter trade), tables. The show, Fight or Flight, continues until this Saturday, November 19th. More of this artist’s work, a series of paintings based on her preoccupation with collecting and preserving, can be seen at this year’s One of a Kind Show. Erin Vincent is an artist and a sculpture teacher at The Art Centre, Central Technical School inToronto.